I recently led two corporate training sessions for millennial professionals struggling to engage with their Gen X and baby boomer colleagues. While we discussed several macro issues – such as the millennials’ desire for more feedback and training – we also dealt with some of the small issues that cause friction between the generations. The biggest of the small generational challenges was definitely voice mail. For the vast majority of millennials, voice mail is outdated, annoying, pointless and unbearably slow. But many people still consider it a vital business tool. In the past I used to point out to young professionals that there are instances in which voice mail can be a useful communication choice, such as when someone can’t reach you and doesn’t want to leave a record of their words in a written email, too. Or, I would suggest to millennials, it could feel easier for members of older generations to express tone or subtlety with their voices rather than the written word. And in my final attempt to defend voice mail (perhaps because I’m old enough to remember how exciting it was to get voice mail in the first place, rather than an answering machine that could only be checked when I was at home and required the annoyance of rewinding and fast forwarding), I would say that people used voice mail to give their messages a more personal touch. As you can imagine, I’ve stopped trying to defend voice mail to millennials. But, as in my training sessions this past week, the topic prompts a valuable discussion about how the workplace will change when millennials comprise the majority of the workplace (a tipping point projected to take place around 2020). Will landline phones disappear next? Or perhaps email, replaced by a combination of texts, IM, wikis and social networks? No matter what, voice mail is clearly on the chopping block. In fact, some forward-thinking organizations have already ditched it. Coca-Cola recently became the largest company yet to drop its voice mail system, calling the move a way “to simplify the way we work and increase productivity” at its Atlanta headquarters. I also interpret the move as a way to signify to younger workers that Coke “gets it” and wants to be an employer of choice for millennials (as Bloomberg points out, it wasn’t a cost-saving strategy; the company estimated the savings at only about $100,000 a year). Other generations at Coca-Cola were pleased as well. According to the company, it gave workers the option to retain their voice mail and only six percent of employees opted to keep it. That means a lot of boomers and Xers dislike voice mail, too. One of the things I say often is that millennials want what members of other generations want in the workplace – they are just more willing to ask for what they desire and leave if they don’t get it. 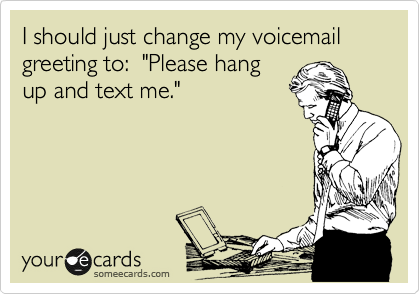 Add “the death of voice mail” to that growing list. How do you feel about voice mail and the future of work? Please share in the comments! I wonder how social networking apps like Whatsapp affects the workplace and how organizations can utilize it for their benefit. @Aveek – Thank you for the comment. I haven’t heard a lot about Whatsapp in the workplace (yet), but texting and internal instant message platforms are becoming more and more common, even at large organizations. The challenge I always hear from companies about apps is the privacy issue — until they are comfortable with that, I don’t know how many organizations will embrace platforms like Whatsapp. As a non-millennial I’m left wondering if conversations over the phone are okay or if I should just avoid calling altogether? @Jamie – Good question. The phone is definitely still important. What Millennials tell me is they shy away from the phone when a call is unexpected and they can’t prepare for it. If you want speak to a Millennial by phone, your best bet is to schedule the call with them in advance rather than calling out of the blue. Thanks for the comment! I think voicemail is still important in the arena for doctor’s offices to leave messages to remind of appointments. But I feel it is a dying piece of technology. My son has his voicemail prompt recorded in Spanish to make sure that none of his family or friends can leave him a voice mail. He thinks it’s funny that none of us can speak two languages. He just doesn’t want to mess with checking voicemail. He says if people want him they can text him. I miss the days when we left messages to those we loved and it could be played over and over again. I’m a romantic I guess, thank goodness we have voice recording on the smart phone. @Marsha – That is funny about your son’s Spanish voice mail message. I might have to use that story in one of my Millennial presentations! Regarding your romantic feelings about voice mail, you might enjoy this article: http://gizmodo.com/youre-wrong-about-voicemail-1645667990. Thanks for the comment! @Kevin – I’m not sure. Now that every phone has caller ID, people can still avoid calls they don’t want to answer. It will be interesting to see how it all plays out! Thanks for the comment. I work with teens who don’t even set up their voicemails! The problem I have is that I feel like texts are so impersonal, and show just a total lack of personalization. In other words, I feel like I am being a “better” professional by leaving a voice mail. Your article is making me rethink this? Is it really “nicer” to send a text? I don’t want to seem outdated, but I also don’t want to be flippant?? Is it me?? @Mandee – I think a lot of people feel the way you do, but I do think you’re right to rethink this issue. If the teens turn off their voice mail, that’s a clear message they don’t want to communicate that way! My suggestion is to ask clients and colleagues — or anyone you do business with — how they prefer to communicate. There are so many options today, maybe being a “better” professionals means communicating the way people most want. Keep me posted! Wanted to chime in on Whatsapp; this is something I use with my team in India. Works great, easy to use..
1. Millennials have disdain for phone usage, unless they have to and that is to reach a client. 2Their main source of communication is texting, I see no warmth. 9. Self centered bunch because they can only see what affects them…not anyone else. @Mae – Thank you for sharing your thoughts!